This should be a much closer series than the statistics show. Montreal was undefeated in 8 games this season against the Bruins but that was with a healthy Koivu and Huet between the pipes. Boston is missing their top 2 centers in Savard and Bergeron in addition to their top goaltender and top free agent acquisition in Fernandez. Montreal lacks several key ingredients that lead to a Stanley Cup in a Stud defenseman and a “Canadian” born Captain. Seven players in Montreal with over 50 points and a strong power play are too much to handle. This series could be a four game sweep by the offensive giants in the Penguins or a hard fought battle with the Senators Gerber and company stepping up in the absence of Alfredsson and Fisher the team’s top centers. The Penguins are hot; they possess two scoring lines led by Crosby and Malkin. A key deadline deal picking up Hall Gill who has played Jagr well over the years. The return of Gary Roberts can only help. 5 months ago I would have predicted a Senator sweep of the Penguins but this franchise has headed south early this season. Only in the NHL can a team with an inferior record have home ice in the playoffs. The Flyers are hot going 7-2-1 in the past 10 but are in tough with the blazing Capitals going 9-1 in the past 10. Ovechkin locked up the Art Ross trophy and Maurice Richard trophy this season. He will have to wait for the end of the playoffs to be crowned the Hart trophy 2007-2008. Huet has played great since the deadline deal with the Habs, as have Cooke and Federov. Semin and Kozlov make this Russian force deep and tough to beat. Could this be Kolzig’s swan song? The Flyers get great props for the huge changes in 12 months. Well Done! The loss of Gagne with head injuries will be felt in the playoffs although Prospal helps bridge the drop-off. This is a young team with great potential but their team is a season or two away from truly contending. The inexperience of Biron between the pipes could be the difference. This has the makings of a great battle with Gomez playing a huge role. 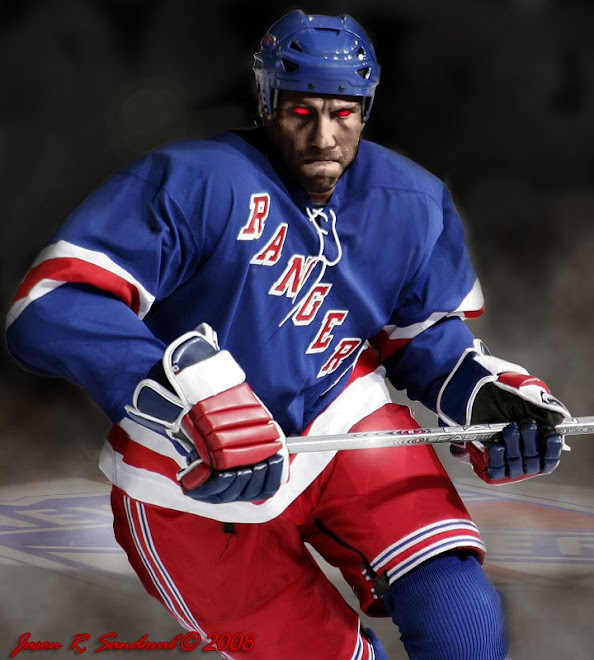 After a slow start the Rangers are in the zone and Jagr is playing brilliant. I believe that a huge playoff by this first ballet hall of famer will have many critics shaking their heads and apologizing. Youth will be served by the strong twenty something’s and the King will shut the door between the pipes. Jersey struggled all season with the Rangers going 1-7 but won the key final game of the season for home ice advantage. Throw out all the stats because Mr. Brodeur doesn’t lose back-to-back games in the playoffs. Jersey lacks the scoring punch in a long series and if the Rangers stay out of the box they should come through this round. A huge shout out to the Predators for coming back this season after an off season sell off by Management. Timmonen, Hartnell, Kariya, Forsberg and Vokoun all left and Steve Sullivan was hurt all season. The Red Wings once again the top team during the regular season have much to prove come the playoffs. Brad Stuart acquired at the deadline brings depth and McCarthy back from retirement returns to the grind line with Maltby and Draper. Will Datsyuk step up this year and contribute offensively? Lidstrom provided 30 minutes a game of great hockey and the depth in goal by Detroit is incredible. The Sharks are once again one of the top 3 teams favored to win Lord Stanley. I believe that this series has all the makings off a big first round upset. Nabakov played much off the regular season without rest and could be tired. Marleau needs to lead or will be gone with the coach Ron Wilson in the off-season. The Sharks gave up some great assets to acquire Brian Campbell who has yet to sign. Mike Kennan has the Flames playing his style of game A big time power forward in 50 goal man Iginla, a minute munching, bone crushing, future Norris trophy winner in Phaneuf and a goalie he can ride in Kipper. If Calgary can get secondary scoring from Lombardi, Huselius, Tanguay and Langkow this team can go far. Another first round upset if you can really consider the Wild to be the favorites. Colorado played much of the season without Sakic, Stastny, Smyth and Forsberg. Ryan Smyth and Adam Foote will bring great playoff grit to the table. Losing Svatos hurts but this team has great depth up front and on the backend with Hannan, Leopold and Salei. Welcome back to the NHL Theodore! It took a while to rid himself of the Paris Hilton fallout but he is back to stay. Look for Theodore to resign with Colorado in the off-season. The Wild are fast and talented but even with one of the best players in the game, Gaborik, it isn’t enough to stop the Avalanche. This will be the best first round series. I hate the NHL format as this could headline the Stanley Cup. The Ducks are so deep on their defense but have some holes up front. Bertuzzi needs to show Brian Burke he was worth his 2-year contract. Corey Perry needs to get healthy and quick. Doug Weight has also not played to expectations and Bobby Ryan has to show his second overall stature. The Stars are also deep with their forwards and defenseman. Landing Brad Richards was the best deadline deal and secures this teams success in the future. Riberio, Morrow and Modano creates two strong lines and Turco proved last season what he can do in the playoffs. 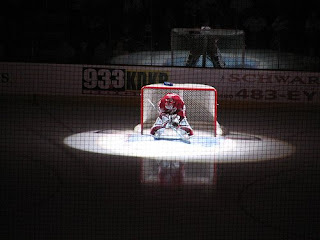 3 shutouts in 7 games – Nuff Said! "Looking forward to the Playoffs and more to come in the second round! 1) Our official predictions posts won't be out until tomorrow, but we'll give ya our Reader's Digst version. Things are looking up for the Dark Ranger as most predictions are fareing well for the Rangers this season. don't be counting your chickens as the devils always surprise come the playoffs. Sutter has a lot to prove. Hmm not sure the Wings sweep. Nashville plays them tough.